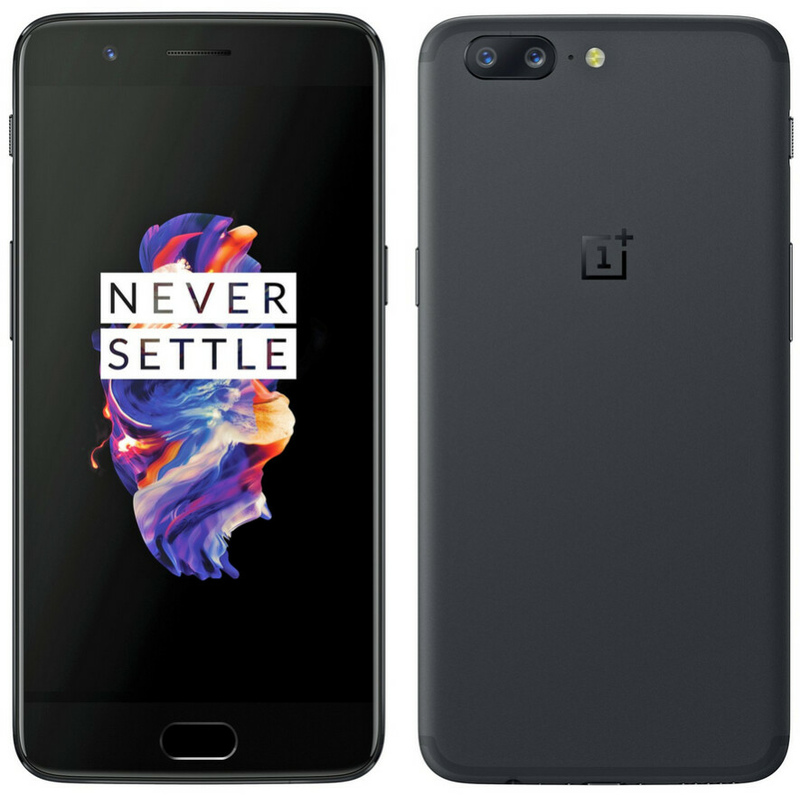 With the introduction of the OnePlus 5 scheduled to take place tomorrow, we now have the clearest image yet of the new flagship killer thanks to tipster extraordinaire Evan Blass.Yesterday, we got a little closer to the actual look of the phone when a few seconds of a television ad aired in India was disseminated on social media. After the introduction of the phone tomorrow, the handset will be launched two days later via flash sales. While Amazon India has an exclusive in the country, in China online-retailer JD.com has started taking registrations for its flash sale. The latter will be held June 22nd at 4:30pm local time. Based on a teaser leaked from Amazon, one model with 6GB of RAM and 64GB of native storage will be priced at Rs.32,999 (equivalent to $512 USD). A model with 8GB of RAM and 128GB of native storage carries a price tag of Rs.37,999 (equivalent to $590 USD). The image posted by Mr. Blass reveals that the horizontally mounted dual-camera setup on the back of the OnePlus 5 does bare a resemblance to the back of the Apple iPhone 7 Plus. Earlier today, a report on the phone's rear cameras revealed that the two snappers consist of a 16MP sensor with an aperture of f/1.7, and a 20MP sensor with a telephoto lens carrying an aperture of f/2.6. Both sensors are made by Sony. We are just hours away from the unveiling of the OnePlus 5. Keep checking in for the latest on this eagerly anticipated phone. It is a plus lookalike, mostly from the back. I'm sorry, but if someone can Photoshop the Apple logo on that back panel, plenty of us will find it tough to differentiate between both phones. This looks identical to the iPhone 7 Plus, atleast that's the way I see it. But the OP looks nicer and more refined. LOL. I remembered how you hate and bash the "big" bezel of the HTC U11. and now here u are with this comment... Double standard eh? fanboys nowadays..tsk tsk. And the front is a Samsung Galaxy look-alike as well. it looks nice, but the price is hurrendous. $600 for the better version? Nah, it's no longer a flagship killer. Nexus had the same thing and then collapsed. for this price, i go for the brand or just wait. My OP3 is still fine. This looks good. I'm excited for the launch. Stop the teasers already! 3 and 3t were no iPhone inspired, have you ever seen one? Looking forward to reviews. Only complaint would be the top and bottom bezels and that 1080p display, neither of which bother me that much. I hope the camera is good because that make this an easy purchase. For 600$ I can buy the newly released HTC 11, with 6GB ram and 128GB storage, here in Uae. At least with HTC I know that I have after service and they will update my device and not leave me. The HTC m9 which has the snapdragon 810 got android N but the oneplus 2 which has almost identical specifications to the m9 didn't. HTC 10 is still £489 here and that's the standard version. HTC always push hard in the US and rip-off Europe and the rest of the world, HTC can go f**k themselves. Clearly no one here reads The Verge. You'll see more than pictures there. Many of us do. Stop with your assumptions. They definitely settled when it came to the design. The dual lens looks a lot better on the oneplus. Sleeker. Makes it look different than an iphone 7 plus to me. Even though the placement is similar. No iphone and other labels too makes it very different at the bottom too. Sure there is some resemblance but it looks a lot better than the iphone 7 plus. The whole looks like an iphone thing is totally overblown. The front looks different as well which is more important. Dude, it's an iPhone 7 Plus lookalike from the back especially. No use trying to make us believe the opposite, when Oneplus CEO himself thanks Apple for educating people on the implementation of dual cameras. Exactly. The back is blatantly iPhone. Dual lens Flash Mic Antenna lines Place a silver or black apple on the back. Blatantly Apple.